For a headache in progress, try the following. You may find the earlier you stop whatever you’re doing and try one of these techniques, the more likely you will find relief. 1. Cold or hot packs. Put ice (or a bag of frozen peas) in a cloth and press it against the painful spot, or against the back of your neck. If you don’t get relief, switch to a heating pad, hot water bottle, a mi­crowavable hot pack, or a hot, wet towel, covered with plastic wrap and a dry towel or fleece to hold in the heat. Try each for 15 to 20 minutes at a time. 2. Brush your hair. Brush from the temple, moving gradually to the base of the skull. Do one side a time. Then work down the center of your head. • Use your fingers to make small circles on your forehead, tem­ples, and scalp. Massage for up to 30 seconds in each spot. Use a comfortable amount of pressure. • Try this acupressure technique. With your thumb and first finger, squeeze a point near the base of your thumb on your other hand in the webbing between your thumb and first finger. Hold until the discomfort subsides. Repeat up to five times. 4. Also try neck massage. Reach around and cup the base of your neck with your palm. Using a comfortable amount of pressure, knead the muscle slowly from bottom to top. 5. Consider increasing the frequency of your massage sessions, even if you must reduce the length of each session. 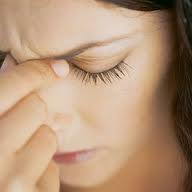 The benefits of massage are cumulative and may act to prevent the development of tension that can lead to headaches.